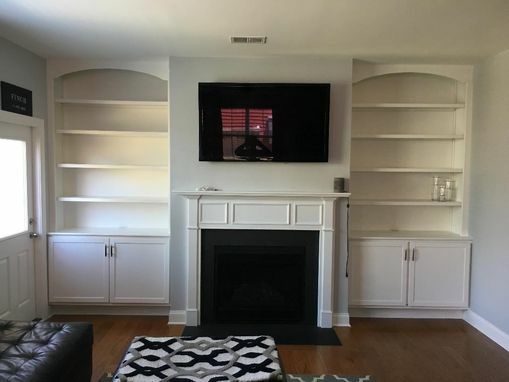 Customer's design for Built-In Fireplace Cabinets & Shelving was completed in a 4 week period. 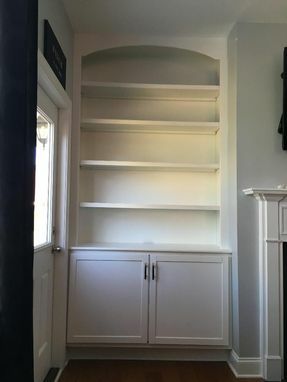 First order of work was to have baseboards from both alcoves removed & saved for reinstalling; back walls & ceilings were painted to match the Cabinets. 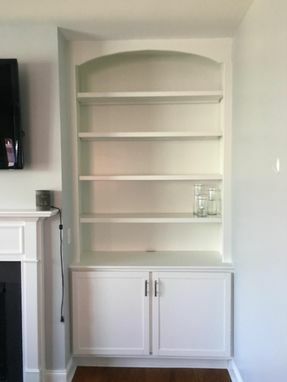 All lower Cabinet & upper Shelving pieces were cut, sanded, & painted off-site; some partial sub-assemblies were also necessary. Installation was completed after all Cabinet & Shelving parts were completed. Hardware included European style door hinges, while the customer chose complimentary brushed nickel door pulls.